Kidz Med has created the Thermofocus non-contact thermometer. A pretty interesting device that may well change the way we assess temperatures. Thermofocus is the most modern, advanced and safe device to measure body temperature. It is both convenient and easy to use. Indeed, it is the first “non-contact” medical thermometer. 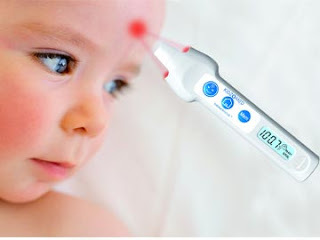 The device enables the temperature of adults and children to be taken without touching the skin, simply by moving the thermometer close to the forehead at the distance indicated by the device. With Thermofocus there is no need to place the thermometer in any part of your or your baby’s body. A sleeping baby or patient will not be woken when Thermofocus is used nor will they be caused any discomfort by the device if they are awake. 1 Gig of Storage - In Your Watch? A laser that kills viruses? An amazing find at Sam's! ePocrates Now Available for the Blackberry!!! Welcome to my new blogging home!